Cupping has been quite the buzzword this summer amongst fitness groups. In the Olympics, Michael Phelps appeared poolside with the tell-tale “spots” from his cupping sessions, then powered through his events with his usual impressive skill. No doubt an athlete of this level of achievement has a good grasp of which therapies improve his performance. 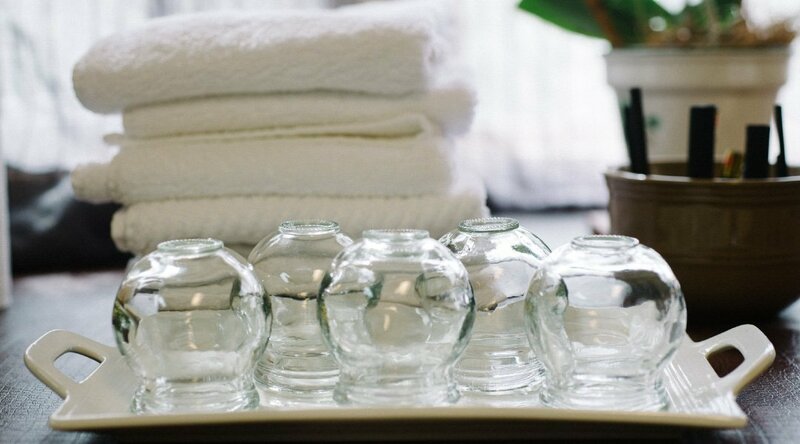 Cupping is part of traditional Chinese medicine, and dates back thousands of years. It can be used on any fleshy part of the body, most typically used for pain relief. I often describe cupping is a “reverse massage technique” that uses suction rather than pressure to get things moving and relax muscles. When used diagnostically, the practitioner pays particular attention to where the suction leaves red marks, noting that as an area of stagnation. Upon noticing these areas, the focus turns to therapeutics, and movement of the cups is concentrated over the areas that need the most invigoration. Reducing pain. We always say that “pain is the great motivator to try something new”, and this brings many people to our door for both cupping and acupuncture. When cupping increases blood flow to the area of suction or “pulling”, the tissue receives an infusion of fresh blood, containing oxygen and nutrients. When cups are released, the newly mobilized lymphatic and interstitial fluids are able to haul off metabolized waste, and swelling and soreness are reduced. All of these facilitate rebuilding of muscle tissue. Boosting respiration. For the same reasons, cupping can help manage movement of fluids in the lungs and enable the body to expel phlegm and congestion. Cupping is often done on the upper back to Boost movement of lymphatic fluid and improve immune function, which can shorten the duration of common cold or bronchitis. Traditionally, cupping was used extensively for treatment of tuberculosis. GI improvement. When used around the abdomen and low back, cupping can be beneficial for diarrhea, gastritis, stomach pain and bloating, and even irritable bowel symptoms. With this we are still using the therapeutic goal of creating movement and managing fluids. Better skin function. Skin function, you say? Yes, the skin is our largest organ of detoxification; when this mechanism of ridding the body of toxins and impurities becomes stagnated, trouble is on the way. While celebrities seek it out because it tones and tightens the skin due to improving blood flow and expanding capillaries, cupping also helps reduce acne, skin inflammation, herpes outbreaks (including shingles! ), and breaking up cellulite. Cupping can be very effective as a therapeutic session; another wonderful way to benefit from cupping is to bring a partner and learn to cup each other! Join Bae Parker on Saturday, October 22, 9:30-11:30am to add this to your home self-care repertoire!